The B-Agile 3/B-Safe 35 Elite Travel System pairs superior protection with smart design, making it the safest of the Britax travel systems. The lightweight stroller has a 3-wheel configuration with swivel front wheels and features a quick one-hand fold. The car seat has an extra layer of side protection and a quick-adjust no-rethread harness. The Click & Go System make transitions between the car and the stroller fast and easy. SafeCenter LATCH Installation has center-pull straps that tighten quickly and easily. Plush foam padding and fabrics for luxurious comfort. Removable body pad acts as a cushion for your child and can be removed when your baby outgrows it. Contoured shell takes up little room in your vehicle and minimizes side-to-side movement to maximize protection. Spring-assisted recline and dual level indicators make setting the proper installation angle easy. 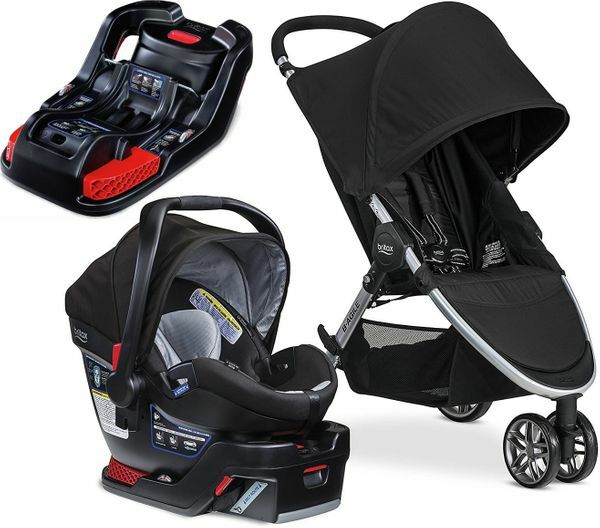 Click & Go stroller compatibility allows you to pair the car seat with any Britax stroller and customize the perfect travel system. Lightweight aluminum frame makes the B-Agile 3 easy to carry. Frame lock keeps stroller together and compact for traveling or storing. 3-wheel configuration with swivel front wheels provides an ultra-tight turning radius. Click & Go System allows for a quick connection to any Britax infant car seat. Large under-seat storage and additional zippered pocket fit all of life’s essentials. 5-point harness adjusts for children as they grow. Infinite recline makes it easy to accommodate sleeping infants or attentive toddlers. Reflective harness straps increase visibility in low-light conditions. The Britax Extra Base provides ultimate travel flexibility in multiple vehicles. Drop in design make it simple to place the car seat into the base for easy and secure traveling. SafeCenter LATCH Installation creates peace of mind by making it easy to install the seat correctly. The Impact Absorbing Base absorbs crash energy and our Impact Stabilizing Steel Frame gives strength where you want it most. Premium features like Easy-On / Easy-Off LATCH Connectors, Spring-Assisted Recline and Dual Level Indicators make installing and setting the proper installation angle simple and easy. This product is compatible with the B-Safe 35 and B-Safe 35 Elite. Drop In Design guides the car seat into the base for quick transfers and safe traveling. Compatible with the Britax B-SAFE 35 and B-SAFE 35 Elite infant car seats.